For a while there, in the late 80s and early 90s, space adventure with the eponymous anti-hero seemed to be all the rage. We had a whole new crop of writers resurrecting what used to be a popular sub-genre: Iain M. Banks, Orson Scott Card, Dan Simmons, Stephen Baxter, Peter F. Hamilton just to name a few. Even established authors found a reason to breath new life into old creations. Take the Stainless Steel Rat series as an example. The first SSR book was published in 1961, the second in 1970, and the third in 1972. Then , starting with the fourth book in 1978, it took off. A new SSR book came out in 82, 85, 87, 93, 94, 96 and 99. Dietz published his first in 1984, and had been turning out about 1 a year even since (although not all space opera). I picked up Drifter's Run at the local swap meet for $1. I can't recall if I'd read it before, but I recognized Deitz's name. Drifter's Run, first published in 1992, is the second book in the Pik Lando series, the first being Drifter and the third being Drifter's War. Pik is a fairly typical heart-of-gold criminal, a smuggler with morals and a conscience, much like another much more famous Lando who first showed up about 9 years before. Lando is on the run for murder, a completely justified murder in his mind, as it was revenge against the man who killed his father. 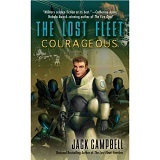 Down on his luck, stalked by bounty hunters, out a ship, and needing to lay low, he takes on a gig as a pilot for a space tug named Junk, crewed by a alcholic captain being hunted by a vengeful cyborg, his eleven year-old daughter, and a floating cyborg robot that goes by the original name of Cy Borg. Various random adventures ensue. There's not much complexity here. Dietz gives us the expected seedy underside of a space empire populated with the usual assortment of aliens, cyborgs, space pirates, bounty hunters, derelict wrecks and more. Despite being the second book, Drifter's Run is self contained and doesn't require reading the first. If you're looking for a quick and easy (and fun) space adventure read, Drifter's Run is a good choice.